If you're looking for a cross platform desktop alternative to Visio with powerful business diagramming tools, ConceptDraw Diagram is definitely worth considering. ConceptDraw Diagram (formerly known as ConceptDraw Pro) is a professional diagramming tool which works on both Mac & PC. Since there is no version of Microsoft Visio on Mac, ConceptDraw Diagram is designed as an alternative to Visio on Mac but also on PC too. In this review, we take a closer look at what ConceptDraw Diagram for Mac can do and what we think of it. 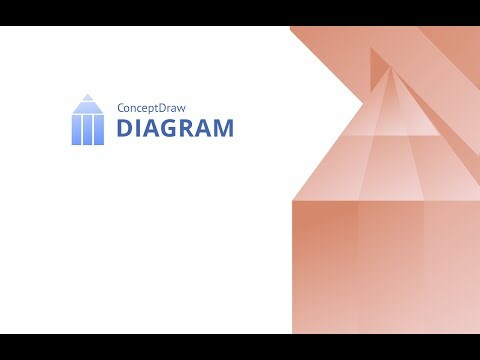 ConceptDraw Diagram is a versatile business graphics and vector drawing tool made by developers CS Odessa that works on both macOS and Windows. Unlike many diagram software solutions nowadays, it’s desktop based (not Cloud) and there’s a well designed Mac client to download and launch from your Dock. ConceptDraw Diagram can be used for almost any kind of business drawing task but is most commonly used for organizational charts, computer network layouts, creating sales maps, electrical diagrams, BPMN diagrams and floor plans. It’s more flexible than for just creating technical diagrams though and can also be used for creating educational material, infographics and presentations. Those that frequently use ConceptDraw Diagram include Project Managers, Architects, Engineers, Teachers and Marketing professionals. ConceptDraw Diagram is part of a bigger suite of tools called ConceptDraw Office which includes ConceptDraw Mindmap for mind-mapping or brainstorming and ConceptDraw Project for project management. If you use either of the two latter tools, then using ConceptDraw Diagram makes a lot of sense because it’s fully integrated with both. One of the main selling points of ConceptDraw Diagram is that it can be used as an alternative to Microsoft Visio. However, it should be stressed that the Visio import and export tool does not work very well. ConceptDraw Diagram claims it can import Visio stencils in VSS/VSSX format and both import and export files in the latest Visio 2016 VSDX format. However, the reality is that the formatting is often messed up in the Mac version of ConceptDraw when importing and exporting Visio files on all kinds and we don’t recommend it for this. If you need reliable VSDX export support on Mac, we strongly recommend SmartDraw which does not an excellent job of importing and exporting Visio files. ConceptDraw Diagram also has many of the features found in Microsoft Visio such as Snap To Grid, Layers and Connection Tools although they are located in different places compared to in Visio which takes some getting used to at first. One of the things to look for in any decent business diagramming tool is what the templates are like. There are many templates available in ConceptDraw Diagram and within each category there are plenty of subsets of templates for specific diagrams and layouts. One of the standout features of ConceptDraw Diagram is RapidDraw. RapidDraw makes instant connections via Smart Connectors based on the layout of objects which significantly speeds-up the process of creating flowcharts, org charts, process flows and more. When it comes to creating building plans, ConceptDraw also has some pretty robust tools. ConceptDraw has templates for office layouts, piping and instrumentation diagrams (P&ID), heating, ventilation, air conditioning (HVAC) and emergency exit plans. There are also various keyboard shortcuts in ConceptDraw Diagram to speed-up your workflow. If you want to see more of what ConceptDraw Diagram can do, check out these samples of diagrams and charts created with it. The biggest drawback we found with ConceptDraw was the poor handling of Visio files. The Mac version simply doesn’t import and export Visio files or stencil well at all despite claims that it does. One of the advantages of ConceptDraw Diagram is that it’s entirely desktop based. However, nowadays this is also one of the drawbacks because you can’t access it anywhere like a Cloud diagramming tool. While it’s also great that ConceptDraw Diagram supports Visio 2016 VSDX export, the results are inconsistent and there can be a lot of formatting issues depending on the amount of layers, objects and complexity in the original diagram. ConceptDraw Diagram is only available from the CS Odessa website for $199.